A week before Under the Lights, and Texas is already sizzling with momentum. Navasota 4-star and record-setting wide receiver Tren’Davian Dickson has committed to Texas. 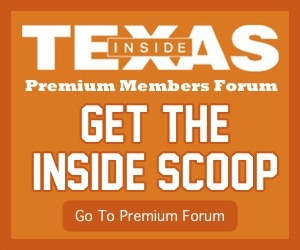 Dickson, once pledged to Baylor, chose UT over Texas A&M, Baylor, Alabama, and USC. Dickson, 6-foot-0, 170, set the national record for scoring receptions in 2014 with 39 touchdowns. He tallied 2,136 yards on 89 catches as a junior. Not bad for the young man from Navasota and a nice grab for new Texas WR skipper, Jay Norvell. Coach says: All the man does is catch touchdowns. I just call him him TD, because he is always getting into the end zone. He isn’t the biggest or the fastest guy you will see at the position, but he catches virtually everything thrown his way. Anytime you put up north of 2,000 yards receiving and crush the national record for touchdown grabs, you are doing something right. Go back and watch the state title game and you will see that this kid is a gamer. He’s great in routes, in and out of his cuts, good feet, and those hands. Man, those hands. Dickson plans to enroll early at Texas. It’s unknown if he’ll be attending UTL on Saturday night at DKR. 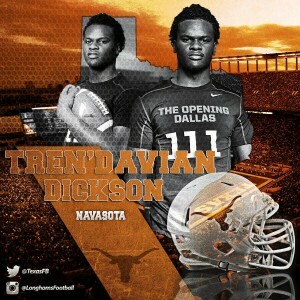 Dickson joins Collin Johnson (WR – Valley Christian (CA), Reggie Hemphill (WR – Manvel), Shane Buechele (QB – Arlington Lamar), Tope Imade (OL – West Mesquite) and DeMarco Boyd (ATH – Gilmer) in UT’s Class of 2016.